Buyer receives a single dispenser made for the 18" roll of stretch film. 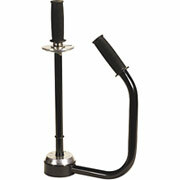 This dispenser is adjustable to support rolls from 11" to 20" in length. Stretch film comes 4 rolls per case, so having a dispenser make for easy handling when you don't have the high powered industrial equipment.